It is the policy of Custom Air Products & Services to provide products and services in compliance with client specifications, recognized codes and standards, and levels of workmanship and quality that result in extended serviceability, operation, and reliability for the systems and components supplied. 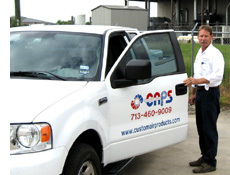 At Custom Air Products & Services we take pride in our products and services and place a high value on quality. The actual quality review process begins at the initial product or project development stage and continues throughout the project until the work is completed. The detailed quality assurance procedures include a review of system components, energy performance, drawings, specifications, load calculations, air and water distribution sizing calculations, and equipment selections. Quality assurance reviews are documented in a comprehensive report written for the benefit of engineers, executive management, and stakeholders. The written reports are augmented with regular meetings and supported by site visits and inspections in order to assess progress and assure adherence to standards. Information learned from the activities is shared with the workforce in order to support the development of best practices and to enable the team to work together to remedy problems and resolve any shortcomings identified. The success of the CAPS Quality Assurance Program has made a strong and positive contribution to our commitment to continuous quality improvement.